Dagenham is the latest exchange added to a growing list of exchanges where the Openreach Fibre First project has full fibre ready for the public to order. The total number of premises where FTTP from Openreach is available to order is now standing at 900,321 and Openreach is still the largest FTTP operator in the United Kingdom by a large margin. The broadband maps have been updated though the highest zoom level may be missing some of the newest postcodes until the tiles have fully finished rendering, the postcode level searches and package search with the final batch of postcodes that took us just past the 900,000 mark overnight. The Fibre First roll-out is making an impact on those urban areas where it is concentrating, for example Bristol 12.6% Openreach FTTP (14.7% all FTTP providers), Birmingham 4.1% (all 6.4%), Liverpool 10.9% (all 14.5%), Leeds 6.8% (all 9.8%), Coventry 3.8% (all 9.8%), Edinburgh 6.6% (all 9.5%), London 3.4% (all 9.9%), Salford 15.2% (all 25.1%) and Cardiff 9.4% (13.5%). Cabinets that have never had VDSL2 and exchange only areas are often included in the roll-out and on a number of exchanges where G.fast has been deployed this is being overlaid with FTTP too. The BDUK projects and the focus of a wide number of smaller FTTP operators has meant that for a long time rural Great Britain was ahead in terms of percentage coverage by full fibre, but the pace of Fibre First, along with urban operators such as CityFibre and Hyperoptic means the gap is closing with 7.7% FTTP coverage in the rural areas of Great Britain versus 5.8% in the urban areas. The declared pace of the Openreach roll-out is 13,000 premises a week, but we are finding it at a much faster pace e.g. adding 45,000 premises in the last 11 days. The assumption is that we are catching up to leading edge of their roll-out since back at the end of January 2019 the last set of financials said the footprint was 893,000 premises as of 31st December 2018. At the declared pace this means Openreach may have a footprint of over 1 million premises and at our current pace we should pass that figure in around four to five weeks. We estimate that the addition of the latest new build premises (started a week ago) will add another 10,000 to 15,000 Openreach FTTP premises in the next 6 weeks and rural FTTP via the BDUK projects will account for another couple of thousand across the United Kingdom but the bulk is going to be Fibre First activity. The future is clearly full fibre but the uncertaintities are around pricing and take-up and what Openreach will be allowed to do in terms of competition with firms like CityFibre. An all out price war in areas where networks overlap would benefit the consumer in the short term but would test the patience of investors and shareholders which in turn could result in decisions to not roll-out to so many areas. While Hyperoptic and Openreach have significant overlap in new build apartments the CityFibre roll-out with Vodafone has not yet over built in an Openreach FTTP area. The much larger overlap that exists is with the old Virgin Media network, but with plans for faster tiers and the TV packages they may feel they are in a good place, a lot hinges on what exactly Sky and TalkTalk do, for example if Sky over multiple FTTP platforms was able to offer its full TV services without a satellite dish and almost throw in a decent broadband FTTP service for close to free. The 900,000 passed I presume isn't 900,000 connected and maybe not even fibre appearing outside peoples homes ready to connect, but just to a distribution point somewhere. For example, if all of those 900,000 'premises passed' called BT to order FTTP, how long would it take for all those properties to be connected? Philip: "The total number of premises where FTTP from Openreach is available to order is now standing at 900,321"
hard to say but if its ready to order most of the hard yards have been done. Cheers, yes I understand it's ready to order, but is the hard work really done? I'm just trying to get a more accurate idea on how close the UK is to be FTTP enabled. It took 2 months for us to get an existing telephone line reconnected and VDSL on moving to a new property! So for BT to really connect up 900,000 properties to FTTP where some will need new poles, roadworks, permissions granted, some ducts unblocked, plus a minimum of 900,000 individual appointments for installing an ONT, I think the hard work has yet to be done and BT are playing a numbers game, and reality is some way away. Premises passed is understood internationally as one measure, and of course take-up or penetration is the next one. The same complaints are to be made about premises passed for every FTTP operator around the globe. So yes reality as in people who have ordered the service is a lot lower, but then this is the case for all FTTP operators. Remember much of the 900k is live fttp already its not 900k available to order but none connected. Its hard to say because the amount of additional work in say a compact built up area or a fibred building could be very different to a rural area. But the difficult/time consuming/expensive bit is getting fibre from the exchange to the closest joint/manifold. The last bit can be very quick if you are close by and the poles are straight forward or the manifold is already mounted with free sockets. Its just a connectorised run from your house. Certainly in the overhead Fibre first areas they will not need " new poles, roadworks, permissions granted, some ducts unblocked" the fibre is all on the DPs so just the final drop and ONT to fit. Rural areas may need more than one span for the final drop but if you have an existing Copper service the rest all exists. Can't say for the ducted premises, but no poles or permissions but no-one can tell until they have ordered what the state of their duct is. Those with UG but no duct will be those that are difficult. 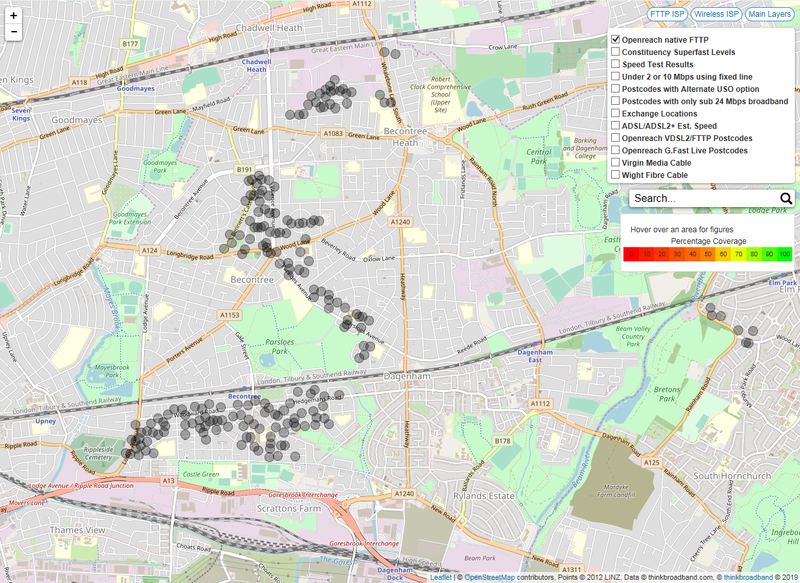 "new poles, roadworks, permissions granted, some ducts unblocked"
What I mean by that is out of 900,000 premises passed if all connected then there will be a percentage that will not be easy. For example we are direct in ground from our DP so not a quick FTTP install. So I would think 900,000 premises 'passed' is the easy bit. According to figures here there are only ~108,000 FTTP connections from BT (guessing most are new builds and so easy to connect up). So the work involved to connect the nation to FTTP is still considerable despite headline figures of 900,000 passed. Where did you get the 108,000 FTTP connections figure? Last results Openreach declared 267,000 actual connections. With there being 30 million premises in the UK, you are stating what is very obvious that a lot more work is to be done. WOW!!! it seems like a few months ago Openreach announced Dagenham was being added to the Fibre first program and now there are already properties showing as stage 1 FTTP available (on the broadband checker). These are not new builds but properties built in the 1930 for works of the then newly opened Ford Motor Company factory. Andrew we have certainly been passed by FTTP but can't get it. Almost a year after the work on the DP outside our house was done as part of the BDUK contract the checker is now showing FTTP available to the houses either side of us but not to us. I can't get a response out of Better Broadband Suffolk as to why, and its no point contacting my ISP as Plusnet don't offer fibre. As for why, mistakes happen hence a relatively steady stream of getting these things fixed for people where it does look like an obvious mistake. i.e. same distance and no obvious obstructions to the DP. As to whether the project is counting you, they should be able to look at their own figures. gerarda: if properties that are literally either side of you (not just vaguely around you) can get fib then that sounds like an admin error. There use to be an openreach number for errors. Not sure your isp can help if they don't do fib but they have the power to get records corrected which could help. For example i've seen cases where the OR record was attacked to a postcode other than the property the line is actual attached to. So when you search for the right postcode it says no fib but search for the wrong one and it works. If you tie the Bt Checker addresses to the Ofcom Addresses thus removing the errors on the Post Code you will find it all drops into place. "With there being 30 million premises in the UK, you are stating what is very obvious that a lot more work is to be done." Indeed, this is why I raised the point and no it isn't obvious really to many. BT saying 900,000 passed is just that, and its not 900,000 premises connect to FTTP. It took 2 months for BT to get an already existing phone line connected up and no physical work was required except for a new faceplate and a few minutes at the PCP to patch in VDSL, and that was after a cancelled appointment. Connecting the millions of properties to their DPs could take decades! The decades, well if people don't upgrade from ADSL2+ or VDSL2 then yes it will take decades since they only connect when you order. Imagine the moans once they do a compulsory swap of copper to fibre, which will happen one day, but that is many years away for now. I feel like you just had a unlucky experience with BT. OR fttp recently went live down my lane, took them less than a week to install the fibre line to the house once I ordered it. For people to upgrade, of course it needs to be available. @BM - where are the Ofcom addresses? The Ofcom Post Codes are on their Web site which gives the address which are in squares these squares are in colours. These addresss tie with the postal addresses which tie with the local government addresses council tax from this you can see the mistakes on the BT Checker. If you have the address and number you can pick up bridges taps and also housess that do not exist. This also gives GPS Lat/Long plus the property number Axxxxxxxxxx. I think what you have been trying to say is that working at the address level, rather than the postcode level improves the accuracy (there are still errors e.g. flats or other buildings with more than one line). The downside is that you are working with 30 million data points rather than 1.6 million and at that level it becomes more time intensive if you are going to check the data. The responsibility is on the ISPs (500+) to get the addresses correct on the Post Codes so all data sync (BT Checker,OfCom,ISP,s)this should be done on every transaction over the 1.6 million Post Codes. I have found that Ofcom is the most accurate. Ofcom is only as accurate as the BT checker since it takes a quarterly snapshot from BT - so how it can be more accurate I don't understand. Suspect its the presentation on the maps that is swinging you. This means new build and roll-outs can be missing for a number of months on what you consider the accurate checker. @BM - I don't see lat/long for my property anywhere. I see an 8 digit number and an A number. @croft12. Checking through the rest of the houses in the postcode it looks like the only premises showing FTTP available are the ones where there is no existing ADSL or FTTC service. It maybe OR have delayed publishing availability at the rest until they have told the ISPs. If you do the conversion on that number it will be the GPS position of your home the A-number is the address name. The address name is tied to your council tax, postal delivery, which Ofcom data /Base uses and many others. As the telephone network was provided using imperial measurement I use this to calculate the line lengths to the base of a mile (1760 Yards) 1 mile= 1.00. Just use Goggle maps I was lucky because I had the method of locating the Cab numbers and locating there positions plus the Post Code positions GPS of the customers across Surrey. Google Maps is using a lookup from postcode to lat/lng just like we use and what some don't realise is that the postcode centre points can move, i.e. Google is not always correct, because underlying data is not always correct and then in next quarter it gets fixed. How someone tracks customers across Surrey is the worrying part, hopefully its some mixed up words, rather than providers passing on data that is private to an individual.